bobile’s easy-to-use push message tool allows you to create, schedule, and send push messages to users. Get users’ attention and keep them engaged with updates, coupons, reminders, and promotions. Send relevant messages to all users, or use our targeting tool to create tailor-made messages based on purchase history or user interests. Nothing says “I care” like a personalized birthday card with a side of coupon. Allow your clients to send personal and engaging offers to users on all those special occasions like birthdays, holidays or anniversaries. Build up interest and increase engagement with special holiday sales, exclusive deals and events that will leave a mark with users. Whether a trainee needs a reminder to hydrate after a workout or a patient need to know it’s time for their annual check-up, our push message tool can schedule daily, weekly, monthly or annually customized reminders. Push notification reminders are the easiest method to keep users in the loop and is a feature that your clients will definitely love. If you invite them, they will come! Create tailor-made messages sent at the right time and the right place. The combination of our geo-location feature and push notification tool will allow you to boost in-store traffic by sending notifications to users located in the vicinity of your business. 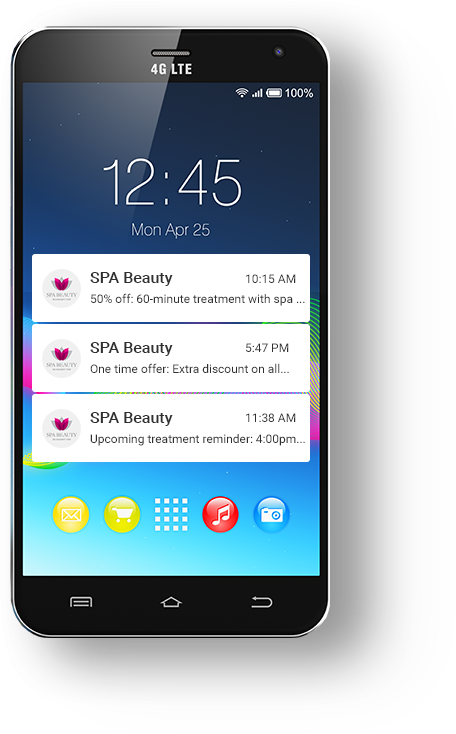 Our push notifications tools enable your clients to send various time-sensitive updates, from holiday greetings to business updates, introduction of new products, limited sales and others. Our time-sensitive push notifications can be sent right away or scheduled in advance. • Promote seasonal offers and discounts that users can receive through their smartphones. • Offer coupons, loyalty cards, products or customized promotions using PDF files, images, links, videos, audios and more. • Share new content, features and updates about your clients’ business, and more.